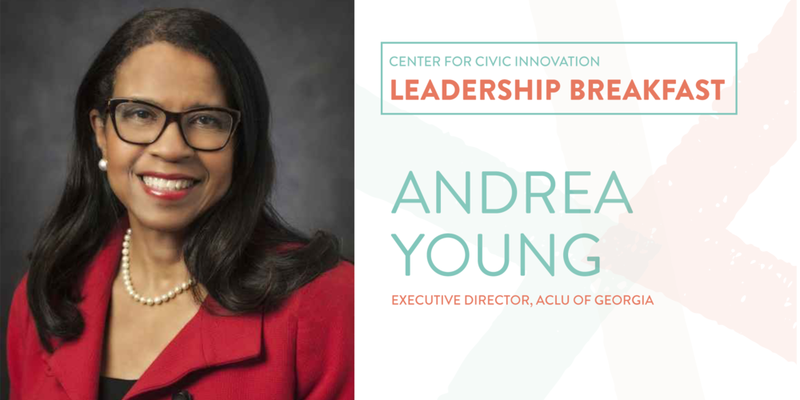 Join us for breakfast with Andrea Young, the Executive Director of the American Civil Liberties Union (ACLU) of Georgia. This event is $15 to cover the cost of coffee and light breakfast. Andrea Young, is the executive director of the 22,000 member American Civil Liberties Union of Georgia. She is a life-long advocate for civil and human rights. Young has led the ACLU of Georgia through an intensive two years focused on building an organization that could advance criminal justice reform, support immigrant rights, and most significantly and immediately, opposing voter suppression and protecting voting rights in advance of the 2018 midterm elections. She developed a strategic expansion that would go beyond ACLU’s traditional litigation work to embrace political action and legislative policy, advocacy, community education and direct action. This work has intensified as state, county and local governments continued their long-term campaign to deny the vote to people of color, and African-Americans in particular, for whom the vote has long been a right denied. Guided by Young’s bone-deep moral and ethical framework, her vision of integrated advocacy has made the ACLU of Georgia the recognized and trusted authority on matters of civil liberties and civil rights in Georgia. Prior to taking the helm of the statewide affiliate of the ACLU in January 2017, Young was an Adjunct Professor at the Andrew Young School of Policy Studies at Georgia State University. For many years, she served as executive director at the Andrew J. Young Foundation producing a nationally-syndicated series of documentary films and other programs on themes of civil and human rights. Young has devoted her career to promoting policies to defend and extend civil and human rights. In the arena of national legislation, Young served as legislative assistant to Senator Edward Kennedy, contributing to significant civil rights and international policy including the Martin Luther King Holiday Act and South Africa sanctions legislation. She later worked with the United Church of Christ in global mission and advocacy, returning to the Capitol to serve as Chief of Staff for the first woman to represent Georgia in Congress, Cynthia McKinney. She served as Vice President for External Affairs for Planned Parenthood of Metropolitan Washington, defending a woman’s right to reproductive healthcare. As Vice President of the National Black Child Development Institute, Young led a school readiness initiative that increased local investments in early care and education and led to a commitment to universal pre-kindergarten in Washington, DC. Young is the author of Life Lessons My Mother Taught Me; co-author of Andrew Young and the Making of Modern Atlanta and collaborated with former Atlanta Mayor Andrew Young in writing, editing and researching An Easy Burden: Civil Rights and the Transformation of America. She has been recognized, nationally for her work as an advocate for civil and human rights. Young is a graduate of Swarthmore College and received her law degree from Georgetown University School of Law. She is a member of the State Bar of Georgia. Young is married to attorney and art consultant, Jerry Thomas. She has one daughter and one granddaughter.